Incorporated in 2003, TAPE is a CVE-certified Service-Disabled Veteran–Owned /8(m) Woman-Owned Small Business (SDVO/WOSB) with a reputation for consistently delivering proven, value-added solutions that meet the most complex challenges facing the government. We maintain the competitive advantage by providing state-of-the-art support service and leveraging our proprietary methodologies and processes. Strategically, we integrate our internal expertise, and the expertise of our partners, into existing processes to bring about measurable results for our clients. We are a registered ISO 9001:2008 company under the International Organization for Standardization. TAPE is dedicated to keeping the nation safe and strong. We are systems engineers and trusted providers committed to building a bridge between our government’s challenges and technically sound solutions. 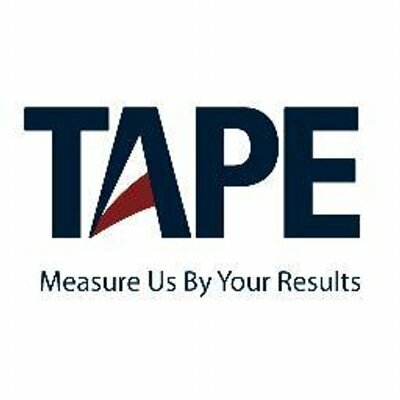 TAPE asks clients to Measure Us By Your Results®. Our clients speak for us through hundreds of employee commendation letters and in formal evaluations. In every rated category of every CPARS, TAPE has received “EXCEPTIONAL” ratings. · Management Solutions: Earned Value Management (EVM), acquisition support, project scheduling, process-based solutions, and business process re-engineering, business planning, strategic planning, systems integration and analysis. · Modeling, Simulation & Training: Full spectrum of targeted, tailored, multi-phased training capabilities ranging from simulation-based combat / warfighting exercises and advanced technology operations to financial management modeling and classroom-based education. · Research, Development, Test & Evaluation: Design, develop and test new concepts for RDT&E planning, execution, and evaluation to assess compliance with the functional, data, technical, and security requirements established within the conceptual system baseline. · IT & Cyber Security: Systems engineering approach to providing IT and cyber security solutions drawn from the most innovative, commercially proven IT and cyber security technologies and tailored to meet the needs of our customers. · Rapid Reaction Excellence (RaRE)®: To counteract today’s asymmetric threats, including terrorist groups and hackers—TAPE’s Rapid Reaction Excellence (RaRE) program was specifically designed to provide a solution to address these asymmetric threats. The RaRE approach dramatically reduces research and development timelines, empowering TAPE to locate the very best technologies, methodologies, and processes for combating these emerging threats at the same rapid pace they develop. · Behavior-Based Performance Metrics Methodology (BBPMM)®: TAPE’s methodology translates an organization’s vision into a set of performance objective distributed among four perspectives: financial, customer, internal business processes, and learning and growth. Established objectives measure an organization’s progress toward achieving its vision and to measure long-term drivers of success. The BBPMM methodology monitors both current performance and its efforts to improve processes, motivate and educate employees, and enhance information systems.